Don't miss out on customers driving right by your storefront because they are confused about if your open or closed. 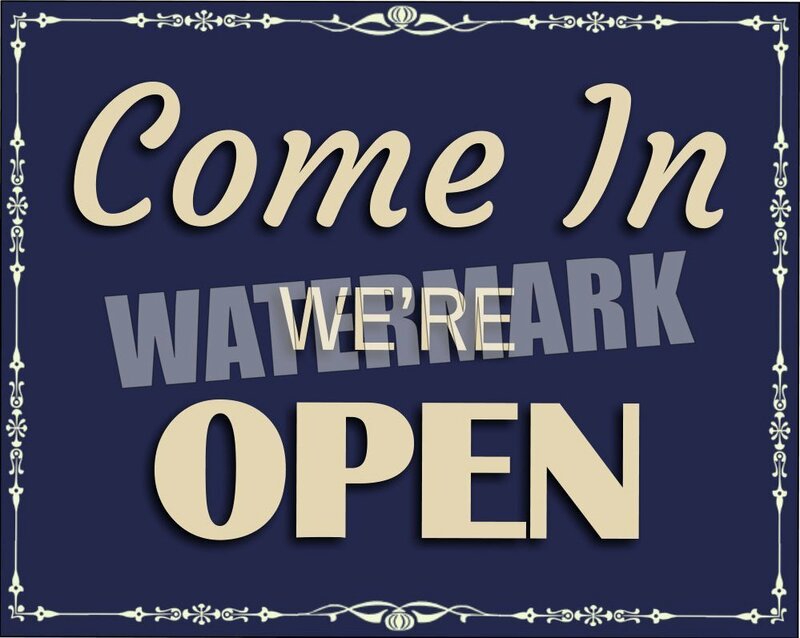 Display these signs boldly to make it obvious when they can come in and visit your establishment. These signs are essential for the success of your business. Consider using a sign for both the front and back door to double your chances of customers walking in your doors. More people = more money! Don't miss out on potential customers just because you haven't put a sign out to announce that you are open for business. Other prints from this collection can be found in our store. In most cases you can click the back arrow in your browser to find them near this listings location, or you can go back the store and search here. ► Purchased files do not have the watermark over the image. This is only for display purposes to protect our work. ► After your payment clears this handmade digital printablewill be ready for instant download for printing and framing for various graphic art projects from wall art, décor, signs, posters, artwork and quotes for the home, business or in your office. ► Can be printed as many times as you wish, but not to be uploaded online in any form. ❋ Each File is a High-Resolution Digital File, resulting in a crisp clean print. All download images are high resolution and have clear image quality print out on it size. ✦ Sizes can easily be scaled down and printed at any size without losing quality. ✦ If you require a specific size, please add the required print size in the "Note to seller" when purchasing the Digital Print and we will send you the requested file size directly to your email. ✦ You can get amazing standard size frames at any of your local department stores including home decor and craft stores. ❋ As soon as your payment clears, Ecwid will email you letting you know that your files are ready to be downloaded. Click the download button to save to your computer. That's it, happy printing! ➊ Print from home or office. Print on any card stock paper. ➋ For professional-looking results, you can email your files or bring on a USB to your local print shop and have it printed on high-quality print paper. Available at Staples®, Office Max®, Office Depot®, Costco, Kinkos, Target or any other professional print shop that accepts image files. ➌ Use an online service to print the design on almost anything you can imagine! Upload your files online, like Shutterfly.com, Mpix.com VistaPrint.com or Snapfish.com. Have a bit of fun and get it printed onto canvas, mugs and much more and then simply have it mailed to you. ➛ You may use this file for your own PERSONAL USE ONLY. ➛ File sharing, distribution, and commercial use of this file or of the printed work from this file are prohibited. ➛ The colors you see on your computer screen may print slightly different on paper. Test print one page first. ➛ Images can be printed as many times as you wish, but not to be uploaded online in any form. ➛ The frame and other accessories shown in above photos are for display purposes only. See our entire line of custom art here. Have fun with your prints and feel free to get creative with them.